August 30, 2011  Just a little more than two years ago, Vick was finishing up an 18-month prison term after being convicted on charges related to dog fighting. What's your reaction to this huge deal? August 21, 2011  When then-Atlanta Falcons quarterback Michael Vick got busted for his connection to a dogfighting ring, Sarah Handel was, if not devastated, certainly disheartened. Since then she's been looking for evidence he truly understands the cost of dogfighting. July 20, 2011  Robert Siegel responds to listener complaints about Michael Vick's appearance on All Things Considered. 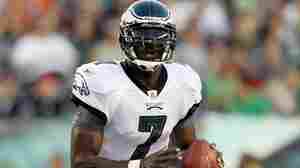 June 6, 2011  As Vick proved, there can be life again in the NFL after time in prison. But Burress is older and he's a wide receiver — not a star quarterback. December 28, 2010  In our first hour of Talk of the Nation, Tammy Duckworth on war veterans, and Michael Vick and second chances. In our second hour, what motivates us to give to charities, and what's changed for the LGBT community in 2010. 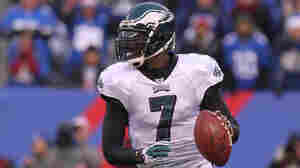 December 28, 2010  President Obama has told Philadelphia Eagles owner Jeffrey Lurie that he's glad the team gave quarterback Michael Vick a "second chance" after his release from jail. October 4, 2010  NPR’s Brakkton Booker was on hand in Philadelphia Sunday for one of the most anticipated moments in sports – the return of NFL star Donovan McNabb, as a Washington Redskin, to his old turf to face off against his former team, the Philadelphia Eagles.